While the domestic cruise industry continued to record rapid growth in 2015, challenges persist and require more policy support, industry insiders said on Monday. China's cruise passenger throughput stood at 2.48 million in 2015, up 44 percent year-on-year, according to the 2015 China Cruise Industry Development Report. The China Cruise & Yacht Industry Association (CCYIA), the Shanghai Hongkou District People's Government and the Shanghai International Shipping Institute (SISI) jointly launched the report on Monday. Statistics from the report also showed that 1.11 million Chinese mainland passengers departed local ports in 2015, up 50 percent year-on-year, while 128,122 overseas passengers made port calls in China, up 4.7 percent year-on-year. "2015 was the first year that the number of mainland passengers exceeded 1 million," Zheng Weihang, executive vice president and secretary-general of the CCYIA, said at a press conference in Shanghai on Monday. "China's cruise market made remarkable progress in its first 10 years of development, with annual mainland passengers expanding from less than 20,000 to more than 1 million." Zheng said that passenger throughput may continue its strong growth momentum, rising by 35 percent to 40 percent in 2016. 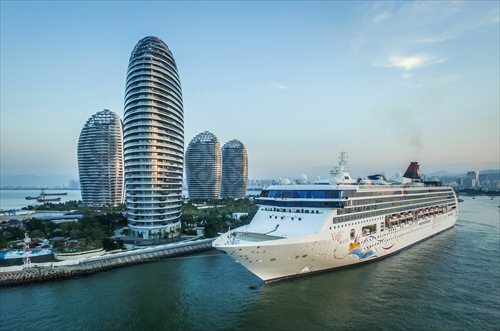 In early 2014, the Ministry of Transport said that China's cruise passengers may reach 4.5 million by 2020, becoming the biggest cruise market in Asia. Encouraged by the explosive growth of the Chinese market, overseas and domestic cruise lines will continue to increase local capacity to meet the rapidly growing demand this year. The number of cruises operating in China will be increased to at least 16 in 2016, from 12 in 2015, and most of the new vessels will be super-sized ones that can carry 2,000 passengers or more, the Monday report estimated. For example, Costa Cruises will add a fourth cruise ship, Costa Fortuna, to its China fleet in April, while MSC Cruises said in September 2015 that Shanghai will serve as the home port for MSC Lirica in 2016. 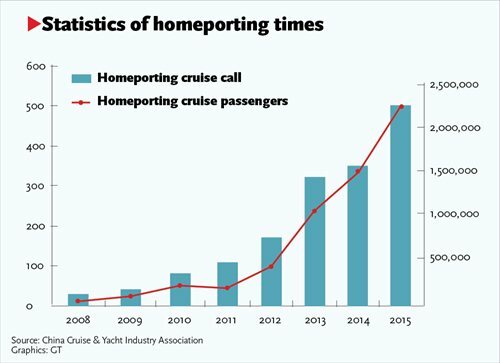 "Charter sailing has greatly contributed to the rapid development in China's cruise market," Cheng Juehao, deputy chief of the SISI Cruise Economy Research Center, said on Monday, noting that full-charter itineraries accounted for more than 90 percent of the cabin sales in 2015, a unique situation in the world and a distinguishing characteristic of the Chinese market. Full-charter sailings involve one party booking all of a ship's accommodations. "Our bookings are made through large travel agencies, and they sell most of the cabins to smaller agencies under the charter sales model, which is a mainstream business model in China," Yang Beilei, senior PR manager of Costa Cruises Shipping Service (Shanghai) Co, told the Global Times on Monday. While the charter sales model makes it easier to market cruises, Cheng pointed out that full-charter operations pose problems and lead to heavy losses for the companies handling charters, which keep prices unreasonably low to win passengers. That business model is among the challenges faced by the cruise sector in China. "Authorities should take steps to prevent cutthroat competition, which is no good for the business," Cheng added. The government should also announce favorable tax, financial and fiscal policies to support the domestic cruise industry, which remains quite weak compared with its overseas rivals, said Zheng from the CCYIA. Only two and one-half cruise liners were operated by Chinese companies in 2015: the Henna run by HNA Cruises, the Chinese Taishan run by Bohai Ferry and the SkySea Cruises, in which Royal Caribbean and Chinese travel company Ctrip each held 35 percent stakes. The Henna ceased operations in November 2015, having reached the age limit of 30 years. "Considering that the overseas cruise industry generally has a history of 60 to 70 years, time and official support are needed for domestic lines," Zheng said.